Alu posto has been a part of traditional Bengali meal from time immemorial in all Bengali households. Any occasion celebrated at home, be that of Jamai Sashti (done for pampering Bengali sons in law) or bhai phonta (done to express love for brothers), seems incomplete without alu posto added to the menu. Alu Posto has different other variations where alu is substituted or supplemented by jhinge and sometimes onion too is added to give an extra flavour. 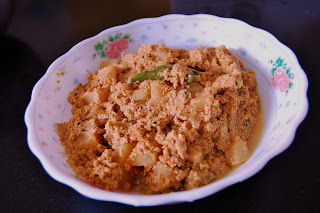 The following recipe is the simplest and easiest version of alu posto and its taste multiplies when cooked by my mother. Afterall, no spice is as delicious as mother's love is. Ingredients:(Serves 4) Cooking time: 30 minutes approx. 1) Heat oil in a frying pan. When the oil turns smoking hot, throw in black cumin seeds and once the seeds start crackling, add potato cubes and lightly fry them till they become slight brown in color. 2) Now add the poppy paste, turmeric powder, coriander and cumin powder. Mix the ingredients well. Add 1/2 cup of water and let it boil. Add salt and slit green chillies. Simmer on medium heat till potatoes turn soft and tender. If required add more water to cook the poppy and potatoes. Be careful of not to let poppy burn at the bottom of the pan. 3) Serve hot with rice.